A couple of IT professionals at Montgomery County Community College in Pennsylvania received recognition for an app they helped create that leverages predictive models in Hobsons' Starfish to send messages directly to students' mobile devices. During their presentation, the team's app pinged judges' smartphones and smart watches to remind them to schedule a tutoring appointment. 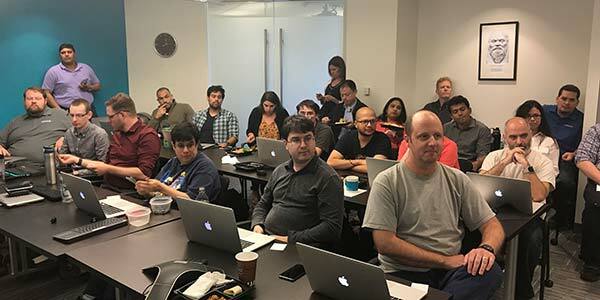 The solution was just one of several systems created during a recent hackathon hosted by Hobsons at its Arlington, VA office. Participants from the University of Georgia took a "most valuable player" award for their work on a mobile real-time student feedback application. At the same time, Hobsons announced that Whatcom Community College in Bellingham was expanding its use of the company's products. According to Hobsons, the hackathon drew about 50 developers, web designers and user experience experts to team up over three days to build programs for use by college students and their advisors. People from institutions that use Hobsons software worked with company developers, data scientists, engineers, designers and product managers to come up with new features, spec their concepts and present their approaches. An overall goal was to focus on functionality that would increase campus-wide adoption and retention rates. Besides a "Going Mobile" award given to the Montgomery County team, a Starfish-only team won an award for their project: "Mapping Courses to Jobs." That program uses natural language processing to extract and match keywords from a student's academic plan to job listings in their area, to help students better understand their school goals. Another Starfish team won acknowledgement for its efforts to develop monitoring and visualization tools that offer insight on how large amounts of data flow within the Starfish platform. That feature so captivated hackathon attendees, who voted it worthy of a "peer recognition" award, that company leadership has decided to fast-track development and integration. "When we thought about hosting a Hackathon, we were looking for an opportunity to take time to focus on our creativity," said Annu Singh, Hobsons' VP of engineering for student success, in a press release. "There are so many processes involved in a traditional approach to development--stories, requirements, alignment, testing, review, refinements--and we did all of that, but we compressed it all into 48 hours." The company intends to host its next hackathon in January. Whatcom CC announced that it had finished a campus-wide deployment of the Starfish Enterprise Success Platform, giving its enrolled base of 11,000 students the ability to plan and explore degree options and receive personalized advising. "The Starfish platform is critical to implementing a guided pathways approach at Whatcom," said David Knapp, the school's director for academic advising and career services. "Starfish gives us a platform for collaborating across campus, providing academic maps and outfitting our advisors, coaches, and faculty with tools to provide proactive academic and career advising for our students." Luca Lewis, Whatcom's vice president for student services said the college had seen "notable gains in faculty participation in early alert student progress reporting and the prevalence of students with online degree plans," calling the adoption rates "a win for us, for students, and for faculty."